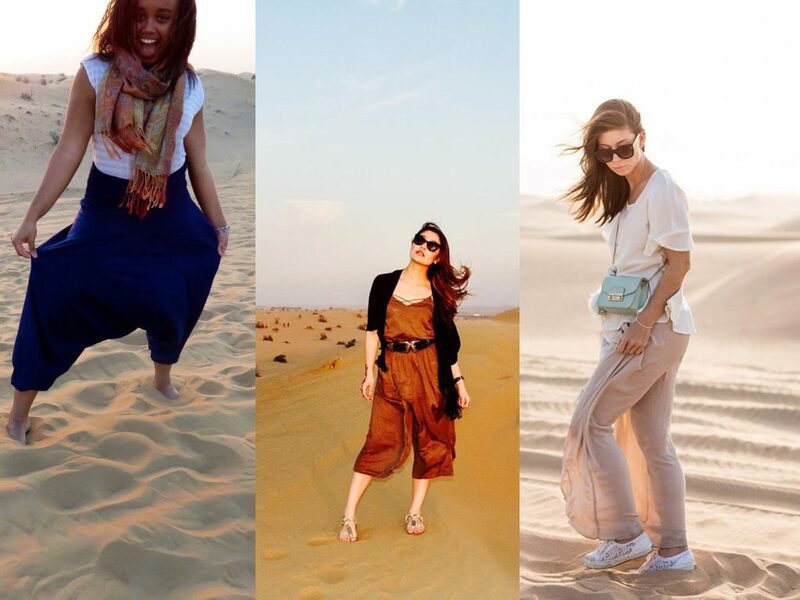 Almost all the tourist ask what to wear during the desert safari tour. So here is the detailed post regarding what wear and why. Wear something with bold prints or same color from top to bottom. So your dress will pop out against all the brown background “Desert.” So we decided what color we are going to wear. Next step is what to wear, there are so many options like you wear a jumpsuit, causal cotton pants, Loose or stretchy pants, or even leggings, Bermuda Shorts, Or high rise long shorts. Shorts idea is best for summer but in winter after sunset weather get cold in the middle of the desert. For the tops, I will recommend at least half sleeve shirts. Half sleeve shirts work in both winter & summer as you have to follow the rules of UAE dress code. So if you are wearing jumpsuit wear blouse on it. Wear something somewhat loose-fitted so they’re comfortable to be in. As you have to sit in a land cruiser for at least an hour, you have to enjoy a camel ride, sand boarding and quad biking. You can also buy an Arabian head scarf from the desert.